That Christianity is a life of receiving and not a life of doing is at the heart of the gospel of grace. It also is at odds with our popular conception and experience. We cannot shake the idea that Christianity is at heart a life of doing, a confusion that sometimes is unnecessarily heightened during Lent. Christians peering into the season of Lent anticipate a period of denial where they are challenged to self-examination and repentance. They take themselves low to root out sin lurking in the dark corners of their person. As much as this is a necessary thing bearing much promise many of us cannot help but see it as a time of rejecting delightful things just because, somehow, we are not supposed to do delightful things. We have bought the misconception that Christianity is a matter of what we do, and in order to help us stop doing we have Lent. This is not, of course, the formal framing of Lent, but that this is how some perceive it is sad. James B. Torrance, a Scottish Presbyterian scholar whose little book Worship, Community, and the Triune God of Grace has recently been refreshment for me, reminds us what we lose when we make our faith primarily about what we do is joy. Repentance (of which much is said during Lent) is not an act we do in order to prompt God to forgive, but it is a reception by us of a forgiveness already given. Christianity is rooted in what God has done securing a forgiveness which we do not prompt but only receive. We have a hard time with this because we can only think in legal terms. God is a judge before whom we stand confessing our sin. Our penitence, perhaps enhanced by a period of Lenten fasting, persuades God to forgive us and we go on our way. That all seems proper and right, but it is contrary to the spirit of the gospel of grace coming from our covenant keeping God who reveals himself as a Father. Repentance is not an act by which we persuade God to respond to our penitence with forgiveness. Repentance is rather our responding to his already secured and pronounced blessing of forgiveness. On the cross of Christ the sacrifice has been offered and forgiveness pronounced, all prior to our confession and repentance. 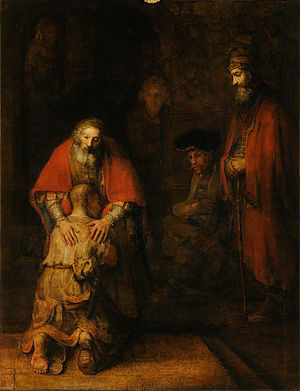 In Jesus’ parable of the prodigal son the father’s heart is gracious toward his son even when the son is in the pigsty. When the son repents and returns, he receives the father’s embrace, an embrace which the father was willing to give all along and which the father did not need to be persuaded to give. Christians tend to enter Lent thinking they need to make themselves somehow more worthy of the Father’s embrace, that they, in some manner, need to act, to do, to urge him to be more forgiving. It is not that at all. Lent is a time for us to clear away the fog and see more clearly the vast measure of the Father’s kindness to us in Christ, that there is in fact no condemnation for we who come to the Father through the Son. Yes, we are encouraged to take concrete action during Lent. We are encouraged to deny certain privileges, perhaps, or certain foods or other things ordinarily permissible. But we do so not to earn or curry the favor of God. We do so to clear away things that obscure our vision that we might more clearly and more joyfully receive the grace that is already there. In this way, Lent is to be a joy. Let us with joyful anticipation enter in. Beautiful!! A revealed truth so eloquently, yet tenderly, expressed. Thank you, Pastor Randy!